For a FREE 'no obligiation' estimate, contact our main office at (931) 381-9966. We are eager to discuss your circumstances and answer your questions – Call us today, or send us an email through our contact form. Complete janitorial services, including office cleaning, windows cleaning, awning cleaning, carpet cleaning, floor care, and maintenance. Fully insured and bonded; family owned and operated. 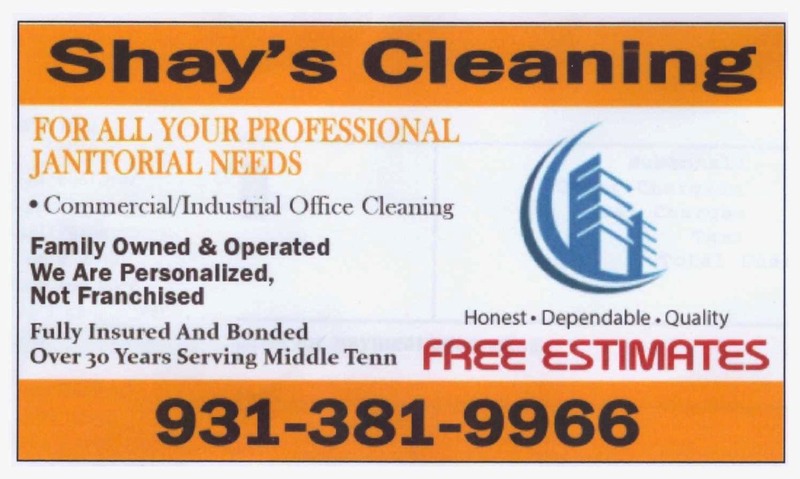 Serving the middle Tennessee area for over 30 years! References include government buildings, industrial factories/warehouses, recreational facilities, retail stores, financial institutions, and medical facilities. Janitorial supplies and paper products sold and delivered. at competitive pricing to fit your budget!